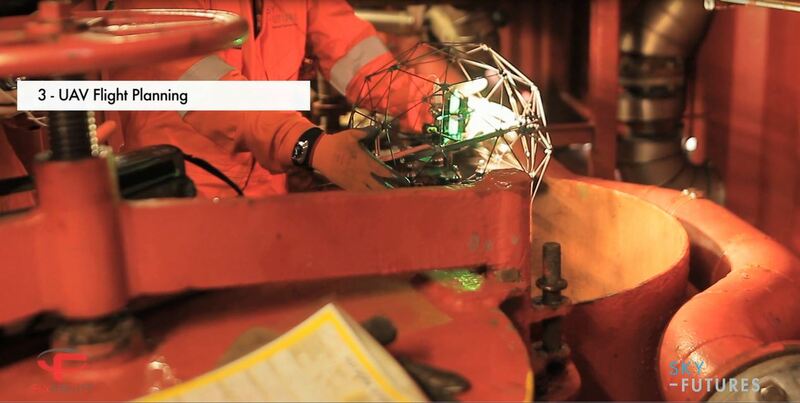 Guided wave ultrasonic testing detects corrosion damage and other defects over long (10m-50m) distances in piping. A special tool (transducer ring) is clamped around the pipe and transmits guided waves in both directions along the pipe. Reflected signals from defects and pipe features such as welds are received by the transducer ring and sent to the main unit. Sophisticated processing and analysis software allows trained operators to interpret these signals and report their findings. Tooling designed for easy attachment and use. Substantially automated testing: tool and pipe size information is read by the G3 unit to minimise manual operator input. 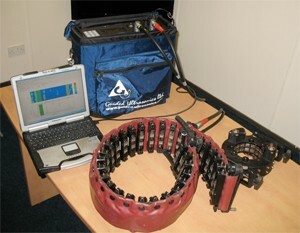 The system checks and calibrates the probes before and after each test to ensure each data set is valid. Ultrasonic signals swept over the full frequency range, in both directions, in a single shot. In addition to faster, more efficient data acquisition, having all the data in a single file makes analysis faster and more certain. Special, wide frequency probes are available for cases such as buried pipe where attenuation is too high over the standard frequency range. Sophisticated software routines help identify and classify signals from the pipe. Embedded reporting software allows the operator to analyse the results and produce a report on the spot. Enhanced Focusing Capability (EFC) rings (pipes 4” and above) improve defect characterisation and provides colour coded C-Scan type maps of the pipe. In effect, the EFC processing focuses on all reflectors over the entire range of the shot. This improves sensitivity as well as making the guided wave data more understandable to the end user. Rigorous operator training and certification with individual electronic keys that activate the system and track its use by each operator. The effect of coatings: bitumen wrap and similar heavy coatings cause high attenuation. 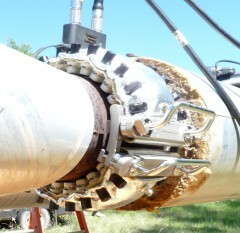 Pipe condition: a corroded line scatters the UT signal and reduces range. Pipe features such as welds: each weld typically reflects 20% of the signal. If there are no other limiting factors, six welds is the maximum. Bends and ‘T’ junctions: distort the signal; you generally cannot test beyond a bend. Contents: high viscosity liquids or waxy deposits attenuate the signal. 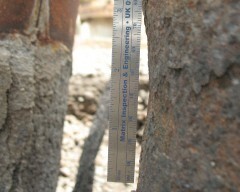 Soil conditions: additional attenuation and usually associated with wrapped pipe. Positioning of the tool is very important in terms of reliable detection of defects in the line. The selection of each test point is based on access, pipe features such as bends and flanges and the estimated test range. Another consideration is the combined dead zone and near-field within ±1m of the tool. This is why it is important to carry out at UT survey of the tool location and ensure the shots overlap. 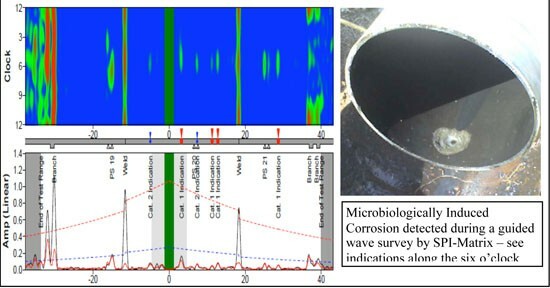 Sensitivity: A rule of thumb is that the system can detect localised corrosion or defects with a cross-section 5% greater than the general level of corrosion in the pipe. In other words, the sensitivity in terms of minimum detectable defect size depends on overall pipe condition. Sensitivity levels are remarkably high where the pipe is generally in good condition as shown in the example of MIC below. GUL Level I personnel, equivalent to ASNT LII, have to demonstrate their ability to test pipe, interpret and report results. GUL Level II personnel must have extensive experience as Level I operators and pass a dedicated, one week LII course. 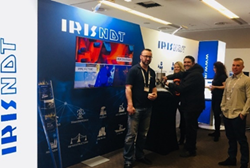 Matrix Inspection has three of these highly qualified, experienced individuals and ten Level I technicians, many with additional certification for specialist applications such as road crossings and buried pipe. Access to the pipe and removal of about a 1m length of insulation at each test point. Surface preparation is usually limited to scraping off loose paint and scale.